Dealing with Notches and Cutouts - Android — The status bar for android this year will have a lot of variations. Android should treat the action bar and the status bar as 1. 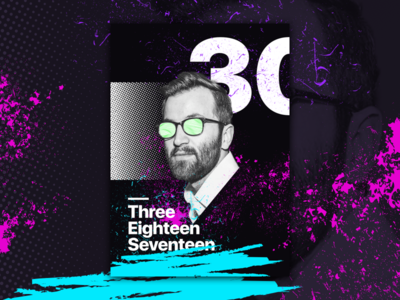 Although the status bar size is a variable based on the phone, devs should code top elements like background images so that a level of consistency across devices can be reached. Explore - Santa Monica - Ipad — This is the ipad version for Explore with Hilton. The dual experience of the list view and map view behind it provides a great user experience for the user. *Animation was speed up due to file size limits. Show Some ❤️ or Some Critiques 🔍.. Explore by Hilton Honors — We just released a new feature in the Hilton Honors App. I have been working on this for awhile and am very proud of the team here. We have partnered with Foursquare to bring searchable locations, restaurants, shopping, and hot spots for your stays at our hotels. *Animation was speed up due to file size limits. Show Some ❤️ or Some Critiques 🔍.. 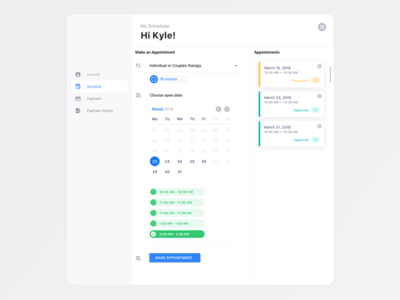 Appointment scheduler — This was a fun project to create both a client portal and a business dashboard to manage appointments. Automation was the key focal point for both the user and the business. A lot of specific legal requirements due to it being a counseling business. Show Some ❤️ or Some Critiques 🔍..
Auto Email for an Appointment — These are auto emails sent from an online scheduler for a counseling business. More to come! Show Some ❤️ or Some Critiques 🔍..
Online Therapy portal — This is part of a larger project for a therapy practice. 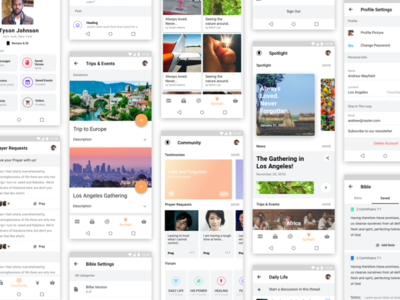 A lot of UX was needed in order to maneuver safely around a personal process of onboarding new users who are seeking counseling for a host of different reasons. More on that later. Show Some ❤️ or Some Critiques 🔍..
01 | Bank of America - Makeover Edition — 01 | Bank of America Products I use every day, and adding a little beauty to it. This is a quick glance at your last 5 transactions that you have made with a force touch. Also, it would be nice to easily see where my card has been saved to from outside sources. Show Some ❤️ or Some Critiques 🔍..
Fantasy Football Scoring Notifications — The moment I saw the X's notch I though of the left and right notifications possibility. 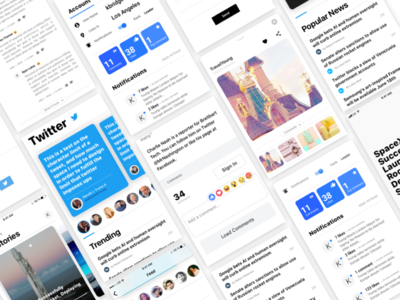 Show Some ❤️ or Some Critiques 🔍..
Social News — This is a social news app, that allows users' engagement to be apart of the content that is pushed to the masses. 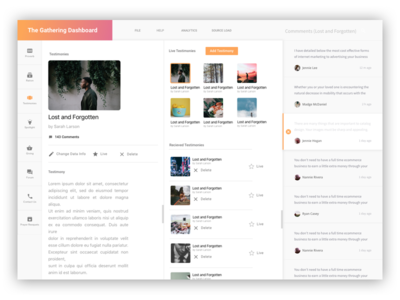 New features that reward comments that are liked by the community. Show Some ❤️ or Some Critiques 🔍..
Instagram Viewer — This is a dynamic feed that has a bunch of social interactions on it. I wanted a really clean and navigable experience with the Instagram viewer. Something that wasn't static and boring. P.S Is it just me or is making the "touch" points at the end of the animation the most annoying thing in the world!!! !😫 😤 Show Some ❤️ or Some Critiques 🔍..
Hotel Details Page — This is a hotel property where a user can easily access a variety of information without being overwhelmed with all the information at once. 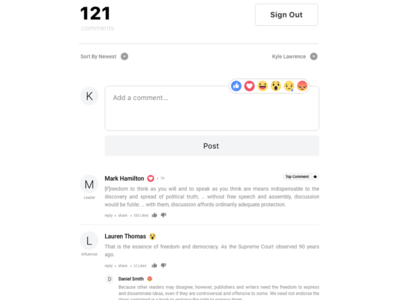 Comment Section — I decided to go with Facebook emojis because of our Facebook integration in the commenting section. Trying to keep things clean here, while also having a little fun with showing the tone of your comments easily. Im sure there will be a lot of internet fighting and trolling done here in the near future 😂. Facebook Login — I never see nice animation when you log into a site using Facebook or some other social login. I think i will decrease the size of the Facebook icon and loading circle when I put this into production. For now it will do 🙃. Android Version for App — This is the android version of an app I am delivering for both platforms. The one new thing I did was take off shadow on the toolbar and only show it when a user initiates a vertical scroll. This doesn't break the material design theory, because the card doesn't go under the other card until it is "pushed" underneath it, creating a shadow. Thoughts? 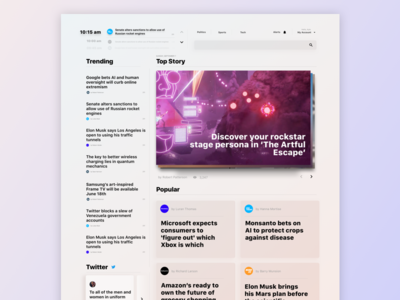 Landing Page — Landing page for a news app I am creating. Some cool animation to the logo coming soon.